Want to ace your job or college interview and have your résumé or application stand out from the rest? This unique and productive guide will show you how. In one hour you will immediately learn how to apply simple techniques that work and do practice drills to refine your impact. See how to prepare at home and discover what to do (and not do) during each phase of the interview. 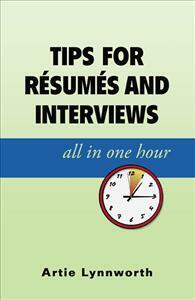 Learn résumé specifics that work. Lynnworth’s 40 successful years in corporate life are condensed into this reader-friendly manual for results. Invest in your future now!